This week's theme is HEADS -"Common". When I took this photo in June, I was extremely excited to show it to my friend, Bear, because we each have a love of nature, animals, and, yes, bugs. I had seen these gigantic, helicopter-sized dragonflies flying around all over the place, but was unable to get one to hold still long enough for me to take a photo. When I got this photo, I excitedly rushed home to show Bear. 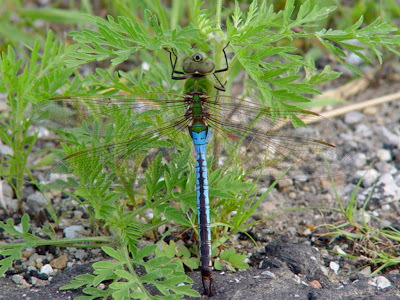 He replied with, "Common Green Darner". I replied with, "BEAR! First of all, it's BLUE! Second of all, there's NOTHING 'COMMON' about this gorgeous bug!" Bear laughed (and probably shook his head) and informed me that he was not insulting my captured critter, he was simply telling me the technical name of it. Ohhhhh, O.K. then. So, here it is, and, trust me, there's NOTHING 'COMMON' about this cool creature! I've been up since 2 a.m. No, this isn't 'common'... It is due to the storms we had last night, which produced winds which made me think my bedroom window was going to be blown right out of the wall and onto my bed. I'm sure I'll be exhausted by this afternoon and wishing I could climb under my desk to take a name and dream about laptop deals. What? Isn't it common to dream about laptops? Helicopter size dragonflies???? I must hide this post from Gina!!! That is a beautiful bug! I hope you get to take a nap today. I would have said blue also. Dude you don't have those out already do you??? Man I'm moving in with you!!! Looks like a dragonfly to me. A blue one. Grin. They are pretty cool and that's one great shot. Hope you get a nap. Storms can sure take the sleep out of a person. Was that a rare sighting or are those dragonflies common in your area? It is beautiful. It's still a Common Green Darner...hehehehe. The female is brown where there is blue on the male. But they definitely are big, gorgeous bugs. Dragonflies are so curious too but I am glad a great big one didn't want to check me out. I thought we had pretty big ones up here although I am not sure they are quite that big. Did you know that dragonflies can mask themselves by hovering at a specific angle and speed so that their prey can't see them. That is where the military got the idea for stealth airplanes. Love the photo of the d.fly... you do great work! Oh, I looked at the Kalanchoe post too... I can never remember what these plants are called (neither can my husband...) so whenever I'm talking about them, I call them "the K plant"... and he always seems to know what I'm talking about.